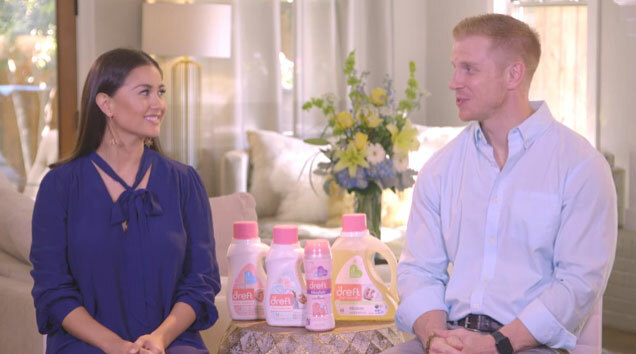 After falling in love on national television, Sean and Catherine Lowe welcomed their first child, son Samuel, last summer. Throughout the past year, the family has partnered with Dreft, the No. 1 pediatrician-recommended baby detergent, to chronicle their most memorable parenting moments on their “Journey of #Amazinghood” via Dreft’s Facebook, Twitter and Instagram channels. From using Dreft to pre-wash Samuel’s fabrics before his arrival – to now utilizing the product to get the stains out of his clothes after his first birthday cake smash – the Lowes know that they can turn to Dreft to gently, yet effectively, clean their little one’s items. Dreft joined the Lowes at their home in Dallas, Texas to begin the celebrations for Samuel’s first birthday. Complete with present opening and a cake smash, the Lowes commemorated this joyous milestone together as a family. As the baby laundry detergent brand most recommended by pediatricians, Dreft is specially formulated to be gentle on baby’s skin and tough on stains. Parents have relied on Dreft for over 80 years to help bring cuddle time to a whole new level of warm and fuzzy. In addition to new Dreft purtouch, which is made from naturally-derived ingredients and 65% plant-based, Dreft also has a product for every stage of babyhood, each specially formulated with growing little ones in mind. From pregnancy through toddlerhood and beyond, Dreft’s family of products has you covered every step of the way on the big, messy, amazing, beautiful journey ahead. Dreft is available at retailers nationwide, in-store and online. For more information and the latest news, please visit www.dreft.com.